See how it works for you. I think Erica pushed to make it a little extra plausible with the “Bandit-shaped hole” at Syr’Nj’s chest height, which would’ve at least taken Syr a bit longer to clamber out of– that was pretty much how I’d seen it, but I don’t think the script made that clear. In the end, this ends up being another early bit where Syr’Nj shows off her smarts but they don’t actually count for much. True, the whole team is riding the ragged edge of incompetence at this point, but there was still a disconnect in how we wanted Syr specifically to be perceived and the jokes we were coming up with for her. In the rest of the chapter, she’d start getting more combat-effective while experiencing a different kind of frustration. Also, I have absolutely no idea what Home Alone reference Phil is talking about in the alt text (unless he just means a blond, kid-proportioned character gasping). I could go watch it again to try to figure it out… but I won’t. Update: Oh, right, of course! Thanks to Wannes in the comments. Wouldn’t have pegged Frigg as a Sinatra fan. She’s got two ears and a HEART, doesn’t she? Care to explain further? Even with your link to that clip I still don’t get it. Like, there is water flooding in both, but how is that a joke? I must be missing some element. In the movie, there are two Wet Bandits, who are called that because they leave the water running in every house they rob. 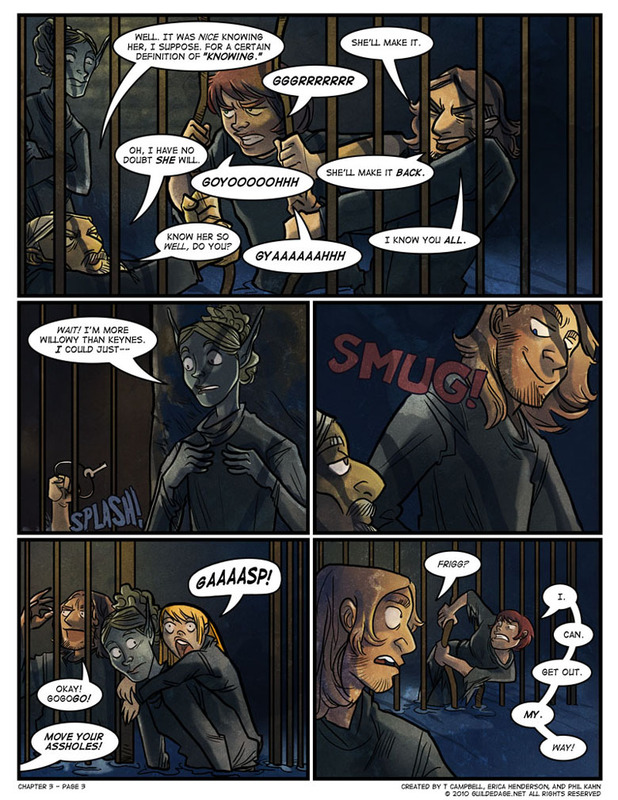 In this comic, there is one wet Bandit, who is wet because she left the water running in this dungeon she robbed just took a dive to get the keys. Ok, I see the paralell, but if that is indeed the intent mentioned in the tiptext then I still have to shake my head in confusion. “We have a Wet Bandit too!” is at best an oblique reference, it doesn’t have any of the elements of a joke, much less a cerebral one. Oh, I agree. 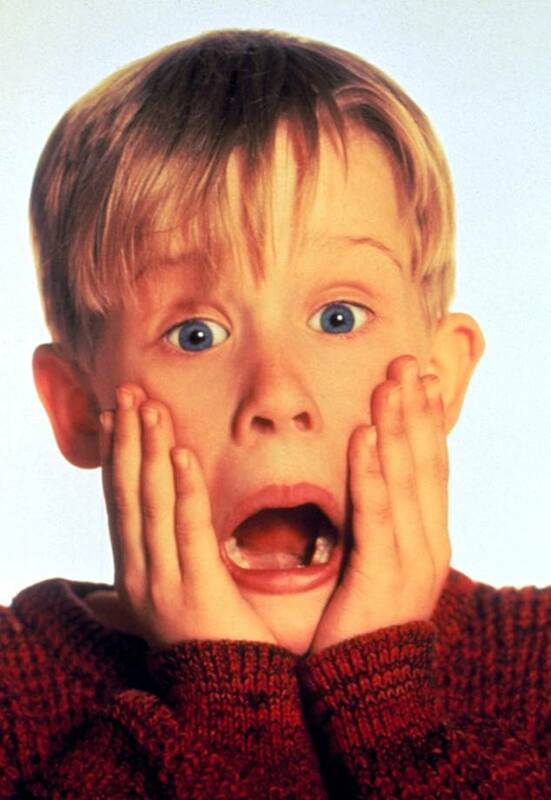 Without that alt-text it would never have occurred to anyone that there was supposed to be any connection to Home Alone. Really the only joke here is the one Phil was having on some readers (and Erica, according to her comments on the original page). In panel 4, who is the third person to speak? The orientation of the speech bubble implies Gravedust and definitely not Frigg, the speech style implies Frigg and definitely not Gravedust, and the context doesn’t make much sense for either of them. It is Frigg. She wants the others to go ahead and flee, but is still convinced she can get herself out without any help. As expected I missed the update while I was on a trip, but I will post anyways because this is one of my favorites, even if nobody gets to read it! I love this page. It just shows a level of trust and camaraderie between Bandit and Byron that I find terribly endearing, as stupid as that is. WELL SHUT YOUR FILTHY MOUTH, I IGNORE YOU AND STILL FEEL TOUCHED AND ATTACHED FOR NO LOGICAL REASON. So, in the end, the resolution to our campaign came even more heart wrenching to me than it should’ve. And don’t even get me started on the next page and Byron’s concern for Frigg. Not just the yelling “Frigg” when she goes under to prank him, but specifically his dialog desperately trying to convince her. But they still bros so all is good.